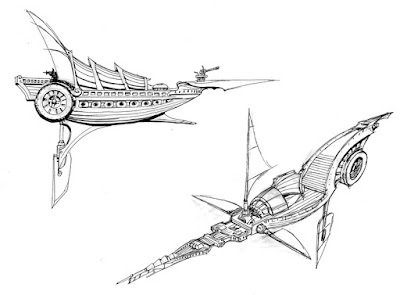 More drawings of Martian ships. 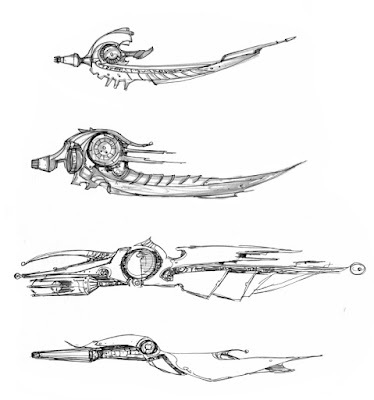 I can't wait to see what the stats on these ships will be. I hear aerial combat is going to be awesome. 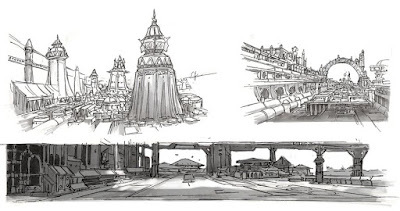 As I assured you in the last post, the writing in my first RPG was even worse than the art. 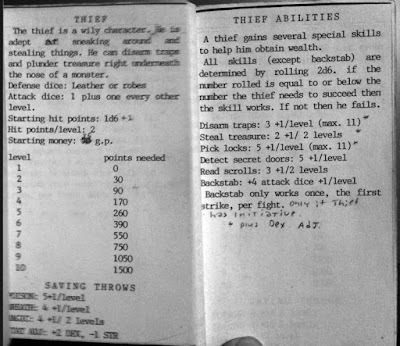 As evidence, I've scanned in the pages describing the Thief class. A wily character indeed! Hey, I was in jr. high, so maybe the bad grammar and juvenile writing is forgivable. Considering how many times I've seen attempts at making a suitable Thief class for OD&D, I think this one could be as good a contender as any. I kid. The infrequent postings of late are due to a number of life factors. Last week I went to Montreal Canada to visit the fine art museum there for a showing of my favorite artist J.W. Waterhouse. Second, I've started a new job - well, really an old job, since I worked there before. And third my computer is getting unpredictable. Time to upgrade. 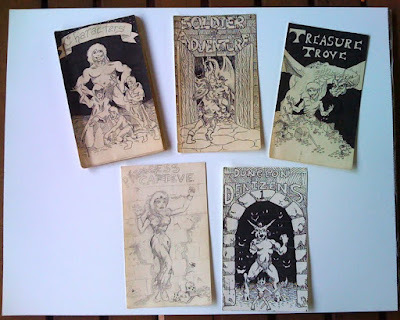 Shortly after discovering D&D in Jr. High sometime around 1980 while living in Marana Arizona, my parents moved to Reno Nevada. This was a period where I had no one I knew who played. All I had where a basic set, a few modules, the DMG, PHB, Deities & Demigods, and Fiend Folio (it was sometime before I finally got the Monster Manual). So I took to using the solo rules in the DMG - and found them basically unplayable. AD&D was just too complex a beast to boil down to a few random tables. So I took to making my own simpler version called Soldier of Adventure! There were 5 hand typed booklets on 3"x5" cards, with plans for an additional 10 booklets! Yeah, the art was terrible. I hadn't learned anything about anatomy or composition yet, and didn't have anything to go by other than the art in the D&D books (I'd seen a Frazetta book once, and I may have had a Boris Vallejo book). Rest assured, as bad as the art was, the writing was even worse! This rules lite "RPG" was an auto-adventure generating game. Characters were based on classes and levels. Advancement was your tried and true XP system for killing stuff and taking its gold. It was all firmly rooted in old school gaming. 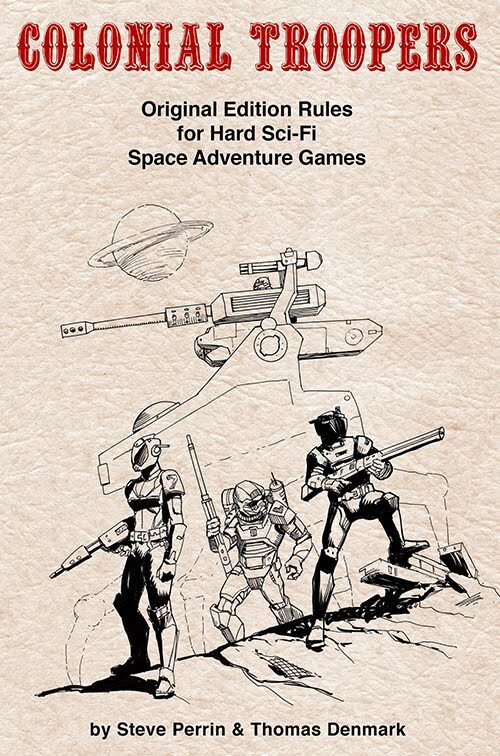 The interesting part of this is that Soldier of Adventure, after many, many iterations finally ended up as the game Dungeoneer published by Atlas Games. I've often considered polishing up the last version, before it became a card game, into a bona fide RPG. 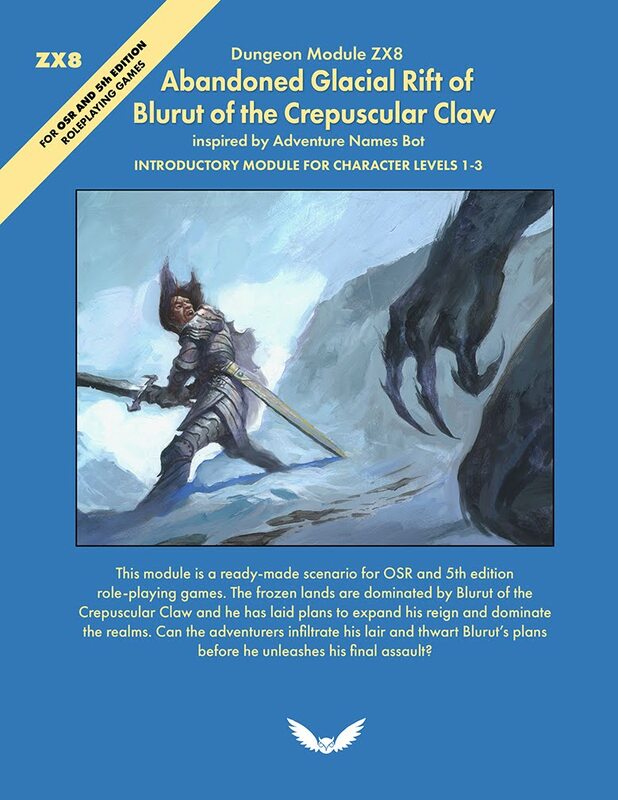 In an embarrassing oversight I made the faux pas of using the term "retro-clone" far too loosely, when I really meant "rules based on old editions of D&D". How could such an amateurish mistake have happened? Certainly someone who has been playing D&D since 1980 would know better?! Well, allow me to explain. I'm relatively late to this retro-clone party, and missed out on some critical early syntax development. Now, visiting the old school boards has become a part of my routine. I've been downloading and reading every free old school game I can get a hold of in order to mine for any precious gems usable in my own campaign. Maybe its not 100% accurate to say I'm late to the party, since this is how I've always played D&D. Since photocopying pages from Dragon magazine in high school, using a mish-mash of D&D and AD&D rules, with heaping teaspoons of my own imagination and friend's ideas into the mix. We had guidelines for your character to achieve deity, dungeons that ran across pages of graph paper with room after room of kobolds, gelatinous cubes, drow, and red dragons. Maybe now I give a little more consideration to reason and believability as far as that is possible in a fantasy game about wizards and dragons. But the spirit is still the same. Rules lite, improvisation rather than slavishly holding to detailed rules, and all in a spirit of fun. Those are the kind of games I meant. I looked through a folder on my PC called "retro clones" and noticed the hodgepodge I'd collected and had this idea of updating this here blog with a handy link list of all the free RPG's that have been made by those, like me, who loved and longed for those days of classic gaming. Well I see retro clones was not a good name for that folder after having read Dan's definition. 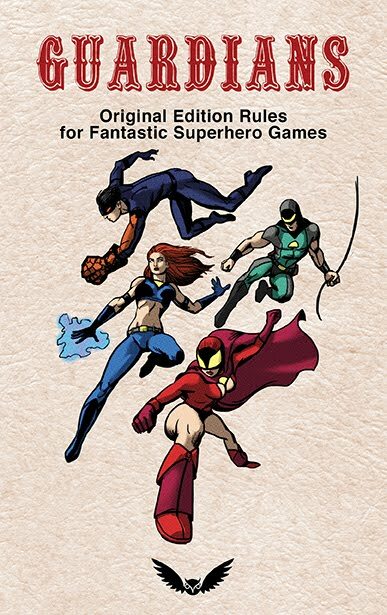 What I really wanted to say were "games similar to all editions of D&D before 4th edition". But that is too much of a mouthful, so I'm just going to call them Free Retro RPG's. Links now posted to the right for your benefit. I'm compiling a link list of all the available free retro clones of note available on the interwebs. I'm sure I've missed quite a few, so if you can point me to more I'll be happy to add them to the link list. I'm working with a fellow writer who is known in the original edition circles, and whose design work I've seen so far is very inspiring. 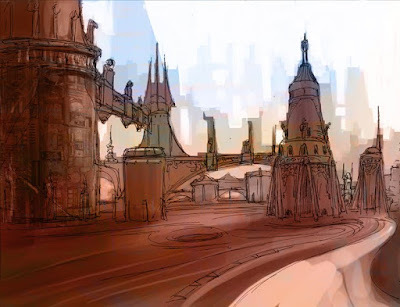 To kick start this here is a tiny taste of some early concept sketches I've done, which in no way represents what the final art looks like. This is just my way of "getting into" the project.